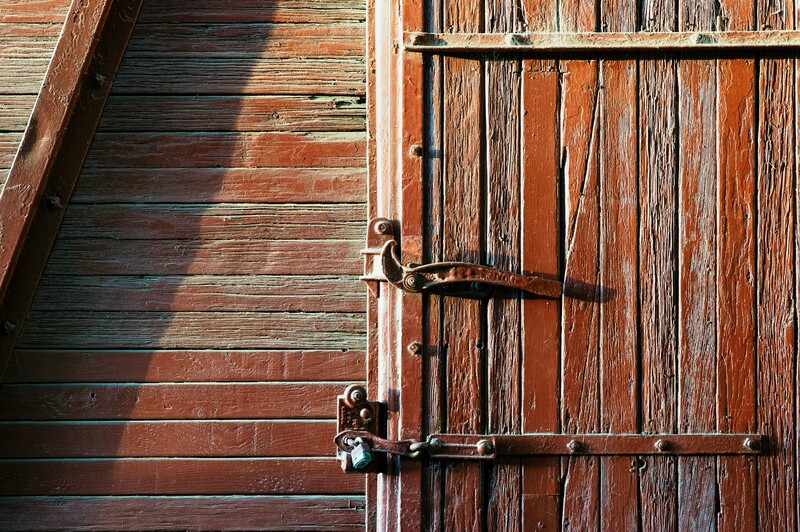 An old box car at Travel Town in Griffith Park. Photo by Steve Hymon. The article takes a skeptical view of the new residential/commercial structures, museum expansions and the Purple Line Extension along already-busy and oft-congested Wilshire Boulevard. As for the subway, the story suggests the project won’t be worth the construction hassles because it won’t fix traffic. The LA Weekly, too, suggests that the lack of parking at the future subway stations is a really bad idea. Fair enough. That’s one view of things. Nothing wrong with administering skepticism, especially on a multi-billion dollar project. Of course, there’s an alternative view. While subway construction will be a pain in the toochus for a few years, the project will benefit the area for many decades to come by providing a fast, reliable and easy transit alternative to traffic (transit hasn’t fixed traffic btw even in cities with giant transit systems). As for development, it’s nothing new on Wilshire and it makes sense to put new buildings on an already busy transit corridor. About parking at those new subway stations: the primary reason that Metro didn’t pursue it is because of the already high cost of real estate acquisition and construction along Wilshire. I’m sure some folks feel like big parking lots and/or garages would not be a good fit for Wilshire, too. Metro is currently evaluating traffic data as part of scheduling the closure of Wilshire Boulevard at La Brea in April to install the decking for the Wilshire/La Brea Station (the first major piece of construction on the project). 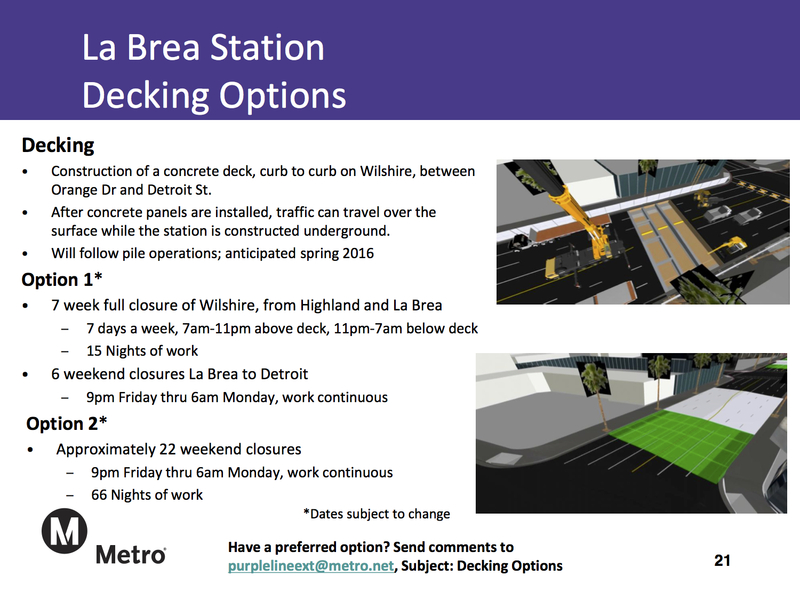 The decking will allow vehicle traffic to resume on Wilshire while the Wilshire/La Brea Station is excavated underneath over the next several years (there will still be some lane closures in the Wilshire/La Brea area throughout the life of the project). Metro has been asking community members to chime in with their opinion on which closure scenario they would rather have. Metro will host a community meeting in January to share its findings. Once a decision is made, we’ll do our best to keep everyone informed about street closures and detours for transit and traffic. The Purple Line Extension is being built in three phases and is funded by the Measure R half-cent sales tax increase approved by 68 percent of L.A. County voters in 2008. The first 3.9-mile segment from Wilshire/Western to Wilshire La Cienega is expected to be complete in late 2023. Transit is stuffed, traffic is bad and the city’s innovation office is thinking a 15km pod car system such as the above could move 237 million people. Of course, the skeptical view is that pod cars is one of those things that some transit fanboys like to trumpet, yet such systems rarely get built outside of airports or other confined areas. This is one reason you hear a lot of talk about innovation from Metro. A big focus of that innovation is finding ways to secure funding for transit, perhaps through partnerships with private firms. One Beijing bar owner sends this message to his bar’s contacts when smog gets really bad (as it did last week) : “Kill your liver, not your lungs, breathe clean air while you drink.” Others, too, are offering smog discounts to lure people out when they’d rather not for obvious reasons. Things to listen to whilst transiting: A really good Fresh Air takes a look at a new documentary “The Spymasters” on Showtime in which 12 former directors of the Central Intelligence Agency are interviewed — with some of their assertions challenged by the filmmakers. I haven’t seen the film, but the Fresh Air episode certainly offers some of the highlights, including a revisiting of who-knew-what-and-when in the months before the 9/11 terror attacks. You can listen below or click this link to read a transcript of the show. BTW, if looking for something to read whilst transiting, the CIA now has a blog and all sorts of interestingness on their website, including a pilot’s manual on how to fly a U2 spy plane. I searched the site and couldn’t find a single mention of Carrie Mathison but did find a page about development of the U2 at the supposedly super secret Area 51 in Nevada. Interesting. Dec. 3: a new name for Pasadena’s bus system, flying versus the environment. Dec. 1: what can you do about climate change? Nov. 30: Does too much cheap or free parking in L.A. County doom transit? And a futurist looks back at L.A.’s transpo past. Nov. 25: How to talk about traffic with your family, transit chief resigns in Phoenix amid allegations of inflated travel expenses. I’m also on Twitter and have a photography blog. Questions? Email me. I didn’t think it was rubbish. It’s a big, expensive project and it’s going to get its tires kicked, whether by the Weekly or others. That said, I embrace the view that this project will serve the area very well over many years. I’m so confused by all the responders who were upset that there wouldn’t be parking AT the stations. How are they expecting to use them–drive their car a mile to park at the station and THEN take the train? I think a lot of these people who were interviewed are dismissing the project because they drive cars and they aren’t familiar with using public transit in the first place. I live in this exact area, and I am pretty used to the drill: I walk a short distance to the nearest bus stop and then transfer when the bus gets to the station. I see this as an ideal for public transit. Railways should be the high speed option, and access to railway stations should be provided by a combination of convenient and accessible bus service, safe biking lanes/zones, and safe pedestrian routes. (It’s amazing when you can take only one bus or train to get to a destination, but the more transfers required, the more delay. So it’s ideal to keep it to one transfer or less.) you want to see this working successfully, get on the 720 express bus down Wilshire, and get off at Wilshire and Western station. If you sit there for a minute, you’ll see dozens of buses unloading passengers at this bustling hub, and a combination of pedestrians and passengers easily entering the station where they can access the Purple Line trains. The point is to NOT use your car, so ideally Metro should strengthen bus service on the Westside to support the new stations on the extension. One of the main weaknesses I see so far is Metro’s neglect of North-South bus traffic on the Westside. If you’ve never taken the 212 or another similar bus, you have no idea how hard it is for folks who work in Hollywood and need to commute from South LA. I have coworkers and friends who do this, and they, of all people deserve an efficient system. I used to commute on the 720 for 45 minutes in the morning, and it could get cutthroat at 9 am. Even after they added the bus only lanes, that route needs more busses at peak hours. LA Weekly needs to interview some residents who support the project. I think it will be great when its done. It’s a Sign of the Times: when someone or something is not what you like or if you disagree with them, you disparage them and their ideas because you cannot countenance any compromise. Amusing that there’s a link at to your Nov 30 HWR entry with the line, “Does too much cheap or free parking in L.A. County doom transit?” You’ve got both perspectives, but both are still speculation. If there are enough local bus connections in place to close the first/last mile gap for most riders, perhaps it might help to do better promotion of those bus routes at each station, or to show on each bus stop sign which rail line(s) it connects to – all you’d need is the colored dots next to the bus line number and descriptor. Unlike 10 years ago, people today can just download an app on their smartphone called Uber or Lyft in which they can hail a rideshare to have their personal chauffeur drive them to the nearest rail station. Use UberPool or LyftLine to get a cheaper price to share a ride with someone else. If you know someone in your apartment that goes to the station, ask them to see if they can share an Uber or Lyft with you every morning and split the cost to get to the rail station. We’ve already solved first mile/last mile through this so there’s absolutely no need for parking at all. And with the advent of autonomous and driverless cars already on the horizon and coming soon as early as next year for higher end vehicles, there’s an even more less need for parking as cars will just continue to drive around looking for passengers instead of hogging up precious parking space for extended periods of time. We don’t need more parking, parking will become obsolete. Why build something when no one is going to be using it 10 years down the road? And for those where parking still exists and remains free, Metro needs to start charging for it. Charge a buck per day, that’s a lot better to increase additional revs for Metro than giving it away for free. The sole reason home owners are against higher density is because they’d rather keep the housing supply artificially low in order to overly inflate the prices for their rundown homes in the already least affordable housing market in the nation. It’s simply greed by NIMBYs and wealthy landowners who are bed with Democrats in government. I bought this manufactured home in the 1940s for less than $10,000 and now I want to sell it for a million bucks!!! But if you build a condo here and it become high density area, I can’t sell my manufactured home built with lead paint and ridden with asbestos problems for a million bucks, it’ll only sell for $200,000 and I’d have to take up a second mortgage to do the fixes in order to put it up on the housing market!! Boo-hoo-hoo, feel sorry for me. The thing is, is that the homeowners are stupid. The homes themselves are worth nothing, it’s the land that they’re sitting on that’s more valuable. Even if a condo or higher density development is made, they’re not going to lose money. The houses are worth nothing, they’ll still be able to sell the plot of land it’s sitting on for a million to a property developer. Three things all relating to the Purple Line story from LA Weekly: (1) Although informative, I have to agree with R22–it was a one-sided article. LA Weekly did not talk to residents living in the area that are in favor of the subway extension nor did the story discussed more about the positives and benefits of the subway line going to the Miracle Mile when it opens in 2024. Yes, construction along Wilshire Boulevard [stinks!]. In Manhattan, Phase 1 of the Second Avenue Subway Line is nearing the finish line as far as construction is concerned (like LA’s Purple Line Extension, three new stations–all underground–are added) The Upper East Side had to put up with non-stop construction and the impact had been disastrous. Some business had to close and residents had to find alternatives to go around the construction, but when the line opens in December 2016 (or early 2017), the neighborhood will benefit for having a second subway line to relieve the overcrowded Lexington Avenue Line. (2) The point in constructing a rail network in America’s second largest city is to (a) give Angelenos a transportation option besides driving in massive gridlock every single morning, not to mention finding parking for those gas-guzzling vehicles, and (b) reduce the amount of smog and greenhouse gases floating into the ozone. (3) Angelenos should not forget that Congressman Henry Waxman stopped the subway from coming to the Miracle Mile back in the 1980s because of an infamous methane gas explosion. Granted the now-Red Line now runs along Hollywood Boulevard serving three stations (the original subway path only had a station near Hollywood and Vine), tunneling was banned in and around the methane gas area. It took former mayor Antonio Villaraigosa’s leadership to rescind the ban on subway tunneling along Wilshire and actually find the funds to make the Purple Line Extension possible. OTOH, it is also true that every other major city in the world, NYC included, still has massive traffic jams on surface streets regardless of how better their transit system is. 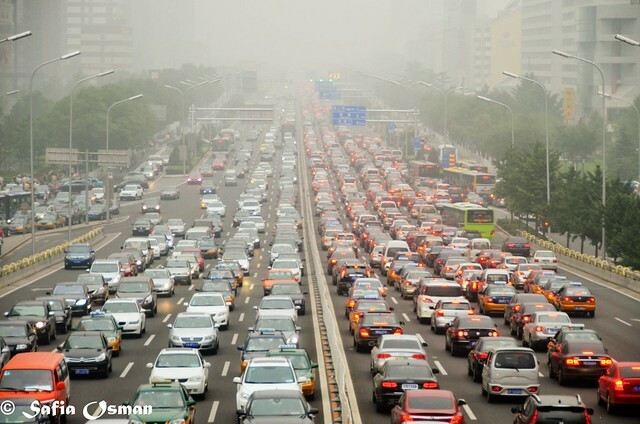 A fine example of this is showcased with the Beijing traffic jam photo above, despite Beijing Capital region is served by one of the best transit systems in the world (Beijing Subway has 18 lines, 319 stations https://en.wikipedia.org/wiki/Beijing_Subway). Mass transit is an alternative, an option, as you stated, but not a replacement. No major city in the world has gotten rid of cars 100% and has made everyone travel around using mass transit. 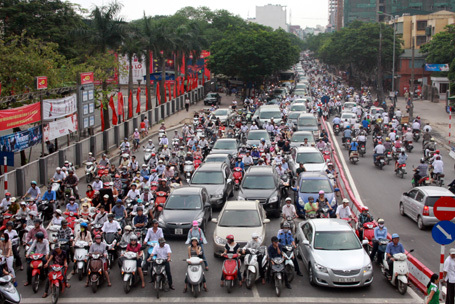 And even with less vehicles and better investment in mass transit, you also can’t say that people can’t also to choose a motorcycle, scooter, or moped to get around, which is the case in Taipei or many SE Asian cities like Bangkok, Ho Chi Minh City, Jakarta, and Kuala Lumpur. Mass transit is an investment to provide the people with alternative ways to get around, but nary a replacement to get people who prefer the cars to use mass transit. L.A. Weekly sometimes has a very snarky tone with Metro that I never quite understood. I get that they aim to be a “punk rock” type of media source, but this type of reporting is just ignorant. I’d expect this type of article in the Beverly Hills publication. The simple fact is that the tone of this article makes metro seem like a bully, when its really not the case. Apathy masked as skepticism makes it easy to seem active. I wonder how Beverly Hills will react to Rodeo once that becomes a reality… Yikes. Hopefully, due to the lack of parking at the purple line stations more people will start to walk to the stations. A half a mile walk doesn’t take a long time and it is very healthy for the body..